Cloisonne is a traditional form of enamel ware that flourished in China in the mid 15th century. Cloisonne making involves elaborate and time consuming processes. They include hammering the copper body to shape, soldering copper wires onto the body, filling the cloisons with enamel powders, firing and polishing the enamel. 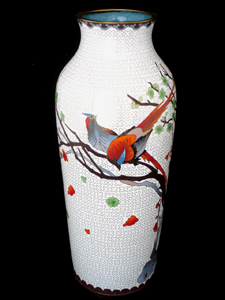 Modern Chinese cloisonne ware is still made using the traditional process. We have sourced some of the most elegant cloisonne vase, cloisonne plate and cloisonne jewelry from numerous cloisonne workshops based in Beijing, China. Most of these enamelware products have been shaped and hand worked by master craftsmen. These finely made cloisonne enamels will add a sense of Asian charm to your delicate home. We also carry recently manufactured Chinese lacquer vase, cinnabar lacquer plate and pen holders, inside painted snuff bottle and beryl crystal specimens. A lot of cloisonne products in Chinese history were in the form of vase, bowl, plate, incense burner and trinket box. These artifacts combined functionality with art so people could appreciate them in their day to day lives. Japanese artisans started to produce cloisonnes in the 19th century. They had mastered the techniques to make some very high quality products, especially cloisonne vases made by Ando and Sato companies. These vases bear very thin silver wires and the designs are filled with the finest enamel. The final product is often more a piece of master artwork than craft. Our crystals are mined in the high mountains in Xue Bao Ding in Sichuan China, which is famous for its natural crystal mines. Our founder actually took the trip to these mountains to source these naturally brilliant beryl crystal and rock crystal specimens. The products we carry in the US are the same products our Asian customers would buy. Our Asian buyers scour China for artisans who create gorgeous, blood red, cinnabar lacquer plates and colorful cloisonne vase and trinket boxes decorated with lush, vibrant peonies that pop off the enamel. Look at the photographs on our product pages for examples - the glass Chinese snuff bottles are painted by skilled artists with bold brush strokes. The pair of strikes on our 12 inch decorative cloisonne vase are so beautifully executed that you can almost hear them chirping. Read more about this tall, slender vase in our blog on cloisonne, Chinese culture. Imagine the wow effect a gorgeous Chinese vase with glossy enamels will bring to your living room. Most products we carry today are from China. We plan to import other interior decoration artworks from Japan and Korea in the near future. We offer a bonus gift, such as a cloisonne enamel powder box, cloisonne chopsticks or a pair of cloisonne Christmas bells with any order greater than $39.99. We are headquartered in the US with branch offices in Beijing, China. It's from our Beijing offices that we locate the Asian artists and artisans who produce our cloisonne vase, cinnabar lacquer plates and snuff bottles. We are also deeply involved in designing these Chinese cloisonne enamel wares. We are working on incorporating western culture and arts into making traditional enamelware. We hope in the near future we can present you with western themed cloisonne plate and cloisonne vase.